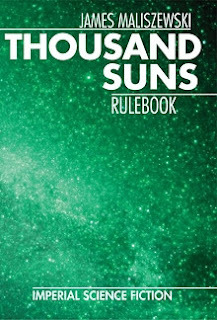 "Thousand Suns is a roleplaying game that takes its inspiration from the classic literary "imperial" science fiction of the '50s, '60s, and '70s written by authors like Poul Anderson, Isaac Asimov, Alfred Bester, Gordon Dickson, Larry Niven, H. Beam Piper, Jerry Pournelle, and A.E. van Vogt, among others. ... This is a complete game, providing all the rules you need to play under one cover, from character generation to starship combat to the creation of alien lifeforms. Also included is the Thousand Suns "meta-setting," a flexible outline of a setting, in which certain details have been provided, along with lots of lots of "blank spaces," and whose final shape and content is entirely up to each Game Master to build upon as he wishes for his campaign." I have mega-plus-good-oodles of to-inifity-and-beyond respect for the gaming insights and writing powers of Mr James Maliszewski of Grognardia fame. If you like your sci-fi with a vast galaxy classic twist then perhaps this has to be a must-own - to read, play or borrow-source for your own game system. "It is a time of wonder. .. It is a time of glory." Looks interesting!! The artwork reminds me of the Mongoose Traveler artwork (still have to play that some time)!